Peter P. Strzok II is a Never-Trump Democrat partisan employed by the United States Civil Service Commission reassigned to the FBI human resources department after being demoted from Deputy Assistant Director (DAD) of the FBI Counterintelligence Division for his involvement in the Trump-Russia collusion hoax and for extreme bias in the investigation headed by Special Counsel Robert Mueller. He is married to Melissa Hodgman, who was promoted to associate director of the SEC in October 2016 during the Weiner laptop investigation as the FBI was trying to run out the clock on re-opening investigations into Hillary Clinton. Strzok oversaw the Clinton email investigation and then was lead investigator on the Trump counterintelligence investigation. On Friday, June 15, 2018, Strzok was physically escorted by authorities from his office amid an investigation of him. Strzok was the direct contact between CIA Director John Brennan and FBI Director James Comey in the Deep state coup attempt to overturn the 2016 presidential election and remove President Donald Trump from office. Email exchanges from 2009 to 2011 exist in which Hillary Clinton Chief of staff Cheryl Mills and Deputy CoS Huma Abedin both directly discussed or were involved in discussing Hillary Clinton’s private email server. Both denied knowledge of it to FBI investigator Peter Strzok. Neither were prosecuted for lying to the FBI despite the FBI being in possession of emails with condemning evidence they lied. Huma Abedin lied to FBI investigator Peter Strzok. Strzok interviewed Huma Abedin on April 5, 2016. Abedin lied to the FBI and was not prosecuted. Strzok reported, "Abedin did not know that Clinton had a private server until about a year and a half ago when it became public knowledge.” In fact Abedin and Cheryl Mills were involved in an Aug. 30, 2011 email exchange in the FBI's possession in which State Department official Stephen Mull mentioned that Clinton's “email server is down.” In another email exchange on Jan. 9, 2011 Abedin was told that Clinton's server had been malfunctioning because “someone was trying to hack us.” “Had to shut down the server,” wrote Clinton IT Specialist Justin Cooper, who told the FBI in his interviews that he discussed Clinton's server with Abedin in 2009, when it was being set up. Cheryl Mills lied to FBI investigator Peter Strzok. Strzok interviewed Cheryl Mills on April 9, 2016. Mills was granted immunity, nevertheless Mills lied to Strzok anyway and was not prosecuted. “Mills did not learn Clinton was using a private server until after Clinton’s [Department of State] tenure...Mills stated she was not even sure she knew what a server was at the time," Strzok reported. Mills asked about it in a Feb. 27, 2010 email to Abedin and an aide to Bill Clinton who helped set up the Clinton Chappaqua server. “Ur funny. We are on the same server,” Cooper replied. The next day President Obama intervened in the ongoing criminal investigation when he publicly declared that Hillary Clinton showed “carelessness” in using a private e-mail server to handle classified information. Strzok texted Lisa Page, his cohort and an FBI lawyer that he was “increasingly profoundly bothered by [ FBI General Counsel James Baker ] call and the lack of ANY heads up. Deeply. It was wrong given what I had already been asked to do...I’m not sure if I want to be part of this.” Lisa Page responded, “You are part of this and that’s not going to change. But I think you have every right to be angry and frustrated about being left out of the loop on your investigation, especially when you’re going to be left holding the bag. . . . Big big case, big big problems.” Sen. Chuck Grassley noted 17 witnesses, including Clinton herself, were interviewed after the decision not to prosecute Clinton was made. FBI Director James Comey met with President Obama in the White House on May 26, 2016; by afternoon Comey's revised draft memo exonerating Clinton was circulating among FBI leadership, General Counsel James Baker, Andrew McCabe, Bill Briestap, Strzok, James Rybicki, Johnathan Moffa, Trisha Anderson, David Bowdich and several others. Strzok changed the language of the draft memo from "grossly negligent" to "extremely careless." Gross negligence in handling classified information is punishable by up to 10 years in prison. On July 2, 2016 Strzok and David Laufman finally conducted the long delayed personal interview with Hillary Clinton. Two witnesses in the investigation, Cheryl Mills and Heather Samuelson, were allowed to sit in. No video, transcript or oath was made. Three days later Dir. Comey usurped the power and authority of the Attorney General and declared Hillary Clinton would not be charged for any of her illegal actions. Days later James Clapper's Office of the Director of National Intelligence announced, in violation of Intelligence Community Directive ICD 732, that no Intelligence Community-wide damage assessment into Secretary Clinton's security breaches would be conducted. ODNI ignored all subsequent FOIA requests. The Clinton Campaign and Democratic National Committee (DNC) hired FusionGPS to conduct ‘Opposition Research’ on Donald Trump. FEC records show Obama for America also paid $972,000 to Perkins Coie, the surrogate law firm for FusionGPS, beginning in April 2016. Mary Jacoby, wife of FusionGPS founder Glenn Simpson, visited the White House in April. FusionGPS then hired Nellie Ohr, wife of Assoc. Dep. Attn. Gen. Bruce Ohr. Nellie Ohr specialized in Russian counterintelligence. Nellie Ohr collaborated with ex-MI6 officer Christopher Steele to write Hillary Clinton's opposition research Steele dossier. By May 2016, Nellie's husband Bruce was working with Strzok. CIA Director John Brennan formed a Joint Counter-Intelligence Task Force. Strzok acted as FBI liaison with Brennan. Brennan himself selected the CIA and FBI analysts who worked on the joint Intelligence Community Assessment (ICA), and they included Peter Strzok. "Strzok was the intermediary between Brennan and Comey, and he was one of the authors of the ICA. Lisa Page and Strzok discussed circumventing federal records laws to hide their nefarious activity. The FBI began an investigation into Trump campaign manager Paul Manafort's associations. This investigation led to the wiretapping of at least three Trump associates, Paul Manafort, Carter Page, and Roger Stone. In June Strzok had direct contact with Christopher Steele and received a preliminary draft of the Steele dossier. According to Clinton campaign manager Robby Mook, the preliminary draft was also given to the DNC and Clinton campaign at that time. Strzok, Bruce Ohr and Lisa Page applied for a FISA warrant to surveil the Trump campaign. The initial warrant application was denied. On July 25, 2016 Strzok and Lisa Page exchanged messages about Strzok's personal friendship with FISA court Judge Rudy Contreras. A year and a half later in December 2017 Contreras accepted a guilty plea from former Trump National Security Advisor Michael Flynn for allegedly lying to Strzok in the early days of the Trump administration. Strzok originally reported Flynn did not lie, however FBI Dep. Dir. Andrew McCabe altered the interview report to say Flynn did lie. Page: Rudy is on the [Foreign Intelligence Surveillance Court]! Did you know that? Strzok: He mentioned thinking about it even though he was junior, they needed people and they especially needed minorities, and then he said he’d gotten on a month or two ago at a graduation party we were both at. Strzok: [Redacted] brought up a good point about being circumspect in talking to [Contreras] in terms of not placing him into a situation where he’d have to recuse himself. Strzok: Really? Rudy, I’m in charge of espionage for the FBI. Any espionage FISA comes before him, what should he do? Given his friend oversees them? Page: Standards for recusal are quite high. I just don’t think this poses an actual conflict. And he doesn’t know what you do? Strzok: Not the level or scope or area. But he’s super thoughtful and rigorous about ethics and conflicts. [redacted] suggested a social setting with others would probably be better than a one on one meeting. On September 2, 2016 Lisa Page wrote about preparing talking points for Dir. Comey because “potus wants to know everything we’re doing.” The text raises questions about the extent of Obama’s personal involvement in on ongoing the FBI investigation. The Obama DOJ's illegal FISA warrant on Carter Page was built on an echo chamber of Hillary Clinton's opposition research among journalists, law enforcement and the intelligence community - all reinforcing each other with the manufactured allegations of the Steele dossier. Michael Isikoff’s September 23, 2016 Yahoo News article, provided by Christopher Steele, was presented to the FISA court as independent corroboration of evidence in the DOJ's possession, which likewise was provided by Christopher Steele. The contents of Isikoff's Yahoo News article was leaked by Steele to Isikoff at the direction of FusionGPS, and focused on Carter Page's July 2016 trip to Moscow. The law firm of Perkins Coie hosted a meeting with Steele and FusionGPS where the matter was discussed. Congress was briefed on the contents of Hillary Clinton's opposition research Steele dossier by the FBI, although Congress and the FISA court were kept in the dark about the false allegations of Russian collusion with the Trump team originating with the Clinton campaign and the Democratic party. Steele was paid $168,000 by the Clinton campaign and DNC. On October 15, 2016 Strzok and DOJ Deputy Bruce Ohr rewrote a narrower FISA warrant application dropping Trump's name and focusing on Carter Page. While the BBC suggested that the surveillance was meant to ferret out “transfers of money,” Louise Mensch asserted that a “warrant was granted to look at the full content of emails and other related documents that may concern US persons.” The FBI did not inform the court that the FBI authorized payment to Steele for the information. On October 21 the FISA court approved the warrant application on Carter Page giving the FBI unfettered and retroactive authority to access Page's upstream and downstream private electronic communications with the Trump campaign. On August 15, 2016 CIA Dir. John Brennan gave an unusual private briefing to Democrat Minority Leader Harry Reid in which he told Reid the FBI should take the lead in an investigation of the Trump campaign. The FBI is the federal agency in charge of domestic intelligence and, unlike the CIA, can spy on U.S. citizens. Two days after Brennan's special briefing, Reid sent a letter to Dir. Comey demanding an investigation targeting “individuals tied to Trump” to determine if they coordinated with the Russian government “to influence our election.” Reid alludes to Carter Page and repeated the unproven charge from Hillary Clinton's opposition research dossier that Page met with two Kremlin officials in Moscow in July 2016 to discuss removing U.S. sanctions on Russia. Carter Page already denied the allegation under oath, swearing he never even met the Russian officials named in Clinton's opposition research dossier. Carter Page is a US citizen who served as a volunteer advisor to the Trump campaign. The October 2016 FISA application first had to be certified by Director Comey or Deputy Director McCabe of the FBI. It then had to be certified by Attorney General Loretta Lynch, Deputy Attorney General Sally Yates, Dana Boente, or Rod Rosenstein, or the Senate-confirmed Assistant Attorney General for National Security Division. The FBI and DOJ obtained one initial FISA warrant and three 90 day FISA renewals from the FISA court. In the case of Carter Page, relevant information and potentially exculpatory material was not provided to the FISA court on these four separate occasions over the next year. Strzok - I think we need to consider the lines of what we disclose to DOJ. For example, the last stipulation notes we will not disclose. For much of the summer, the F.B.I. pursued a widening investigation into a Russian role in the American presidential campaign. Agents scrutinized advisers close to Donald J. Trump, looked for financial connections with Russian financial figures, searched for those involved in hacking the computers of Democrats, and even chased a lead – which they ultimately came to doubt – about a possible secret channel of email communication from the Trump Organization to a Russian bank. Hillary Clinton’s supporters, angry over what they regard as a lack of scrutiny of Mr. Trump by law enforcement officials, pushed for these investigations. Lisa Page wrote to Strzok, “The [New York Times] probability numbers are dropping every day. I’m scared for our organization,” referring to the Times forecast which gave Hillary Clinton a 93% chance of winning on October 25, before dropping to an 85% change as of November 3. When Trump won on election day Strzok texted Lisa Page, "f*****g terrifying." Lisa Page responded, “OMG THIS IS F****** TERRIFYING.” Strzok responds, “Omg, I am so depressed.” Facebook CEO & founder Mark Zuckerberg called the Clinton campaign & Deep State theory that Russian fake news influenced the election "a pretty crazy idea." Sometime around Thanksgiving 2016 Glenn Simpson of FusionGPS and Dep. Attn. Gen. Bruce Ohr met while President-elect Trump was selecting his cabinet, and discussed what Simpson considered the distressing development of Trump's victory. Ohr's wife, Nellie Ohr worked for both FusionGPS and CIA. On December 5, 2016 Strzok gave a false and misleading briefing to the House Intelligence Committee's investigation into Hillary Clinton's Steele dossier. House Intelligence Committee investigators later were contacted by an informant suggesting that there was “documentary evidence” that Strzok was obstructing the House probe into the origins of Hillary Clinton's Steele dossier. John Brennan attached Hillary Clinton's opposition research dossier to the official Presidential daily intelligence briefing for Obama. Obama ordered two pages of the summary to be shared with Trump. The special classified briefing was then leaked to the Washington media, allowing them to use the presidential briefing to justify publication of unsubstantiated claims which by journalistic standards prevented them from using up to that point. When CNN broke the story of the dossier's sensational allegations co-written by Evan Perez - a friend and former colleague of FusionGPS principal Glenn Simpson, it cleared the way for BuzzFeed to publish the entire dossier, and signaled that the intelligence community was implementing the "insurance policy". This completed a circular echo chamber, binding the intelligence community - chartered to steal and keep secrets, to the media - embodying the right to free speech. Russiagate was no longer part of Hillary Clinton's political campaign directed at Trump, it was now a disinformation operation aimed at the American public, as the pre-election media coverage resonated more fully with the Steele dossier in the open. You see, said the mainstream media: everything we published about Trump and Putin is really true—there's a document proving it. What the press corps neglected to add is that they’d been reporting the same talking points and innuendo from the same opposition research since before the election, and were now parroting the same “evidence” to prove it was true. On Tuesday January 10, 2017, CNN stated President-elect Trump was briefed on the Clinton-Steele dossier. An hour later Buzzfeed published the dossier. The next day, Wednesday January 11, Trump said he was not briefed on the dossier. NBC confirmed Trump wasn't briefed. Fox News confirmed Trump wasn't briefed. Later that night Wednesday January 11, DNI James Clapper issued a press statement noting that he had just now briefed President-elect Trump on the dossier moments before. Clapper's press release stated, “The IC has not made any judgment that the information in this document is reliable," yet Clapper's intelligence community used that same dossier with no other evidence to obtain a FISA warrant for direct surveillance of the Trump campaign three months earlier. The fact the "evidence" originated as a political smear campaign from the Clinton campaign and Democratic party was never told to the FISA court. On January 24, 2017 Strzok interviewed National Security Advisor Mike Flynn at the White House. In March Dir. Comey testified to a closed session of the House Intelligence Committee that, while Flynn may have had some honest failures of recollection during his FBI interview, Strzok who questioned him concluded that he did not lie. FBI Dep. Dir. Andy McCabe altered Strzok's interview notes (302s) with Flynn and destroyed evidence. Special Counsel Robert Mueller used the tainted evidence to blackmail Flynn into offering a guilty plea for lying to Strzok, along with threats to prosecute Flynn's son. Strzok's friend, Judge Rudy Contreras was removed from the case days after accepting Flynn's guilty plea, and a new judge is now reviewing the evidence. “For me, and this case, I personally have a sense of unfinished business. I unleashed it with MYE [Mid Year Exam, the FBI codename for the Clinton investigation]. Now I need to fix it and finish it." Lisa Page was working as legal counsel in the office of the FBI Deputy Director Andrew McCabe. In July 2017 Lisa Page flipped against the Deep State conspirators when she realized McCabe was lying to investigators about McCabe's instructions to her to make illegal leaks. When Inspector General Mike Horowitz interviewed Lisa Page about the October 2016 election eve leaks to the Wall Street Journal, she provided the evidence - the Strzok/Lisa Page text messages. Lisa Page presented facts that contradicted McCabe's sworn statements, for which McCabe then was fired. The text messages also showed extreme bias among investigators in the Hillary Clinton email investigation, the Trump-Russia investigation, and Special Counsel Mueller's investigation. Strzok and Lisa Page were fired from the Mueller investigation, and reassigned within the DOJ and FBI. On the day Strzok was fired by Mueller, Mueller had George Papadopoulos arrested at the airport. Within 24 hours Mueller had Papadopoulos agreeing to work as an informant ("proactive cooperator"), to spy on other members of the 2016 Trump campaign, Trump transition, or Trump administration. The responsibility within the FBI operation to clear Clinton and open an investigation against political opponent Donald Trump fell heavily upon FBI Agent Peter Strzok. Strzok was advanced to the #2 position within the FBI counterintelligence unit as an outcome of his participation. In addition to working with FBI counsel Lisa Page, underneath Andrew McCabe, Strzok was the FBI contact and liaison with Christopher Steele and the foreign intelligence apparatus that were assisting in their goals. 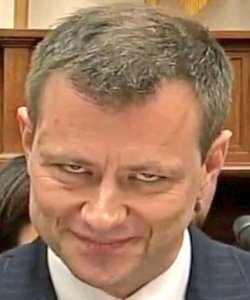 When the FBI's internal Inspection Division (INSD) and Inspector General evidence of the conspiracy began to surface Peter Strzok was removed from special counsel Robert Mueller's investigation and demoted within the FBI. Strzok remains employed within the FBI as a cooperating witness/co-conspirator. Strzok was fired the day after Inspector General Michael Horowitz's report was made public, his security clearance revoked, and was physically escorted from the FBI headquarters. Page – And holy sh*t Cruz just dropped out of the race. It’s going to be a Clinton Trump race. Unbelievable. Strzok - Now the pressure really starts to finish MYE [Mid Year Exam - codename for the Clinton investigation] …. Page - It sure does. We need to talk about follow up call tomorrow. We still never have. ↑ April 2, 2016 Lisa Page text to Strzok: "So look, you say we text on that phone when we talk about Hillary because it can’t be traced, you were just venting, bc you feel bad that you’re gone so much but that can’t be helped right now." Strzok - Oh hot damn. . . We get around our security/monitoring issues? Page - No, he’s proposing that we just stop following them. Apparently the requirement to capture texts came from [Office of Management and Budget], but we’re the only org (I’m told) who is following that rule. His point is, if no one else is doing it why should we. . . I’m told – thought I have seen – that there is an IG report that says everyone is failing. But one has changed anything, so why not just join in the failure. ↑ Nellie Ohr represented the CIA's "Open Source Works" group in a 2010 "expert working group report on international organized crime" along with Bruce Ohr and Glenn Simpson. Open Source Works, the CIA’s in-house open source analysis component, is devoted to intelligence analysis of unclassified, open source information. The directive that established Open Source Works is classified, as is the charter of the organization. CIA says the existence of any such records is a classified fact.